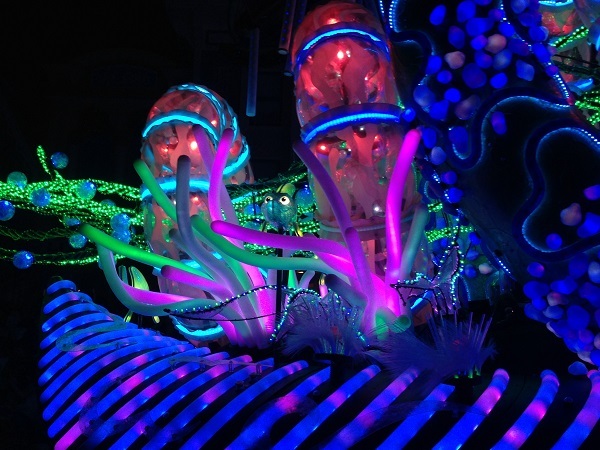 There are many reasons to go to Hong Kong Disneyland, but their newest attraction, the Paint the Night Parade, is the most compelling yet. 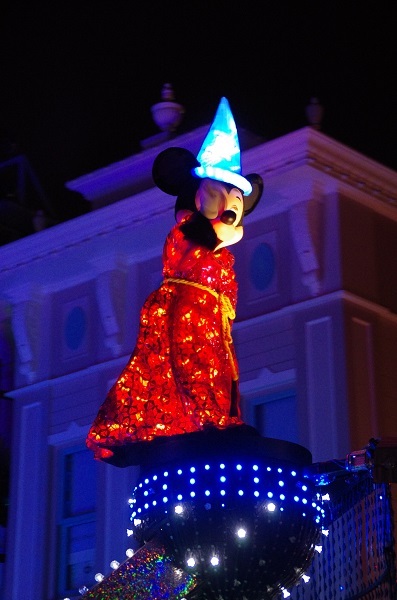 I don’t generally watch the parades when I’m in the parks, except an initial viewing, just to make sure I’m not missing anything. 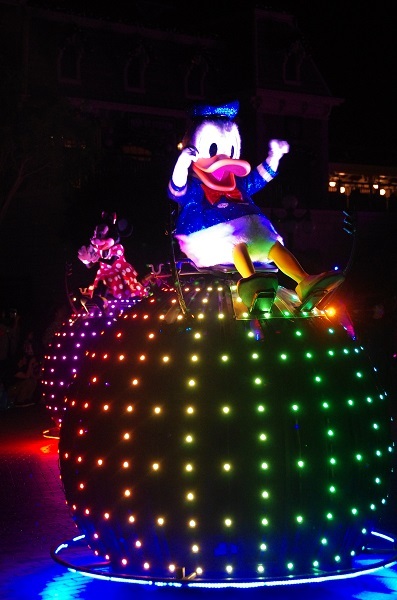 The only parade I make an effort to watch every time I can is the Mickey’s Not So Scary Halloween Party, which is my favorite. 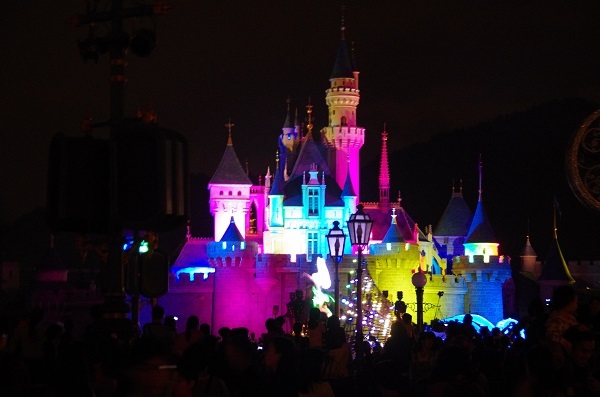 Or was, that is, until my Thanksgiving visit to Hong Kong Disneyland. 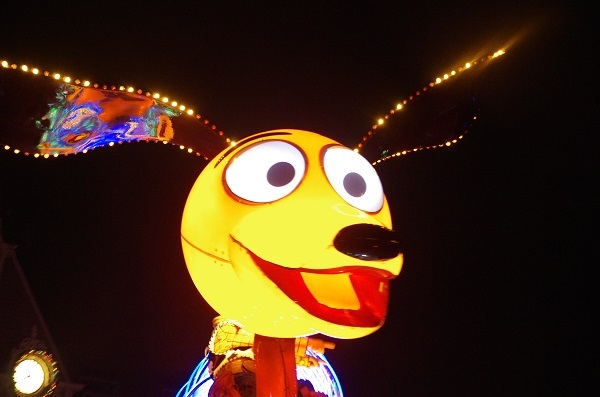 I’d heard about the parade a few months ago (it had been in development for over two years) and it was a big part of the reason for my Thanksgiving trip. 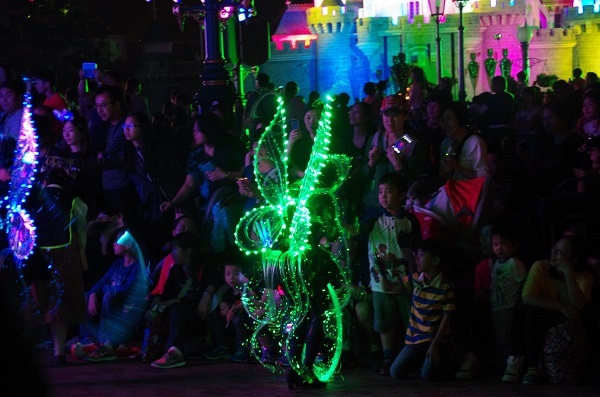 I’d heard there was going to be a new night parade at Hong Kong Disneyland and that it would be interactive. 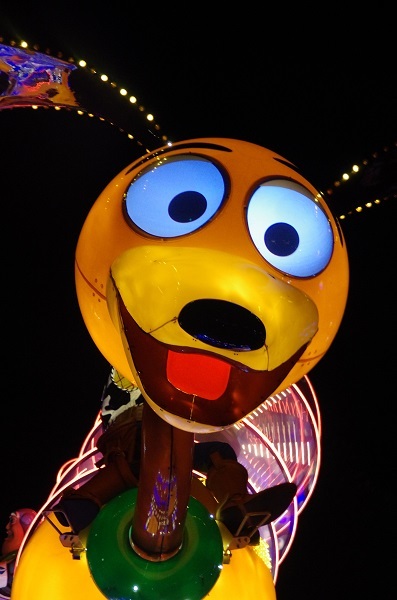 Paint the Night was everything I’d heard about and more. 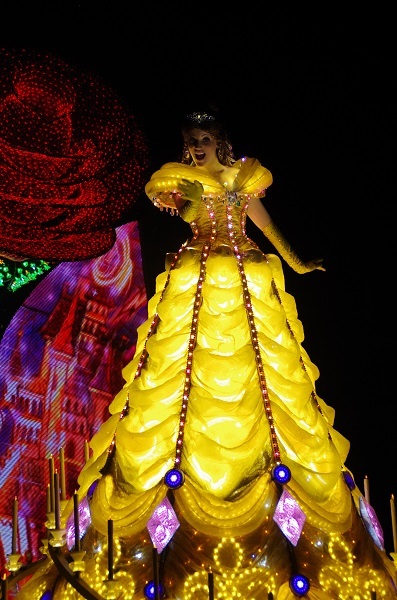 The first night, I was jet-lagged, but there was no way I wasn’t going to stay up to see the parade, with just two nights available. 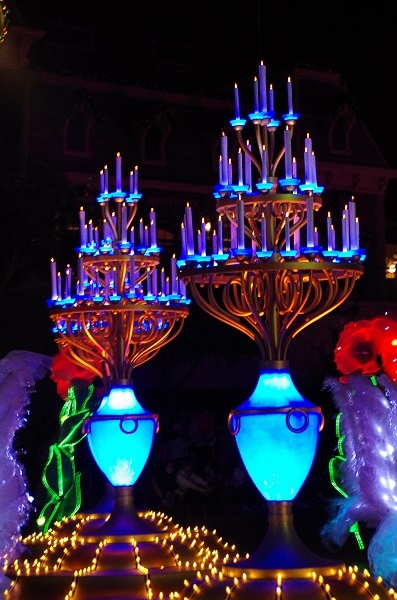 I had dinner at the Explorers Club, because there was a Paint the Night dinner set that included dinner for 2, a Mickey Magic Paint Brush and either a Mickey Glow Mitt or Minnie Glow Bow (I opted for the Glow Bow). 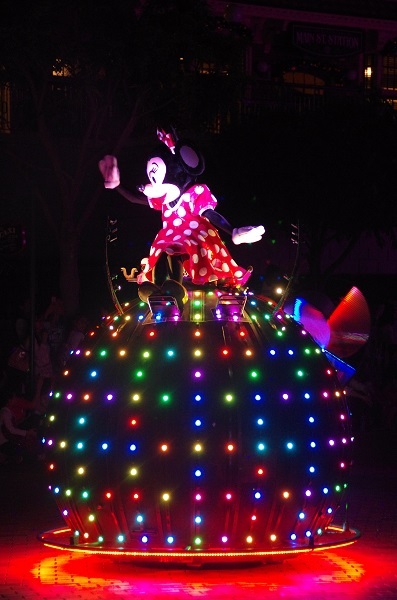 As with the Glow with the Show Mickey Ears at Disneyland, the Glow Mitt and Glow Bow respond to signals in the parade, making viewers a part of the show. 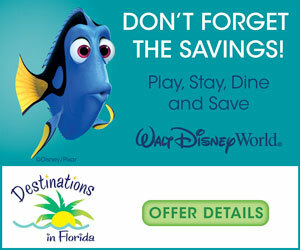 On the advice of my friend, Derrick, I waited in front of the Plaza Restaurant for an optimal experience. 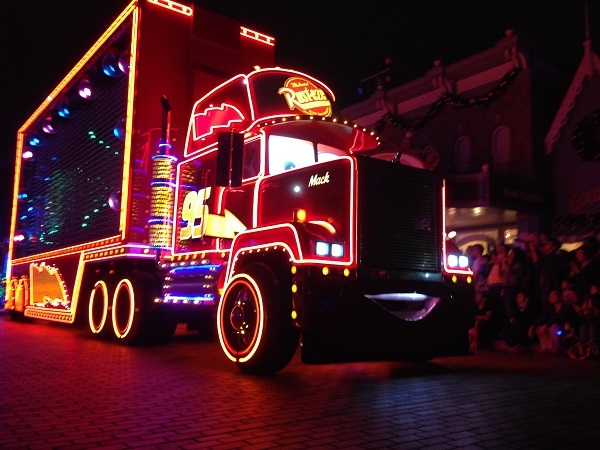 There are seven floats in the parade, combining Disney and Pixar characters, in an all LED light show, with over 740,000 individual lights. 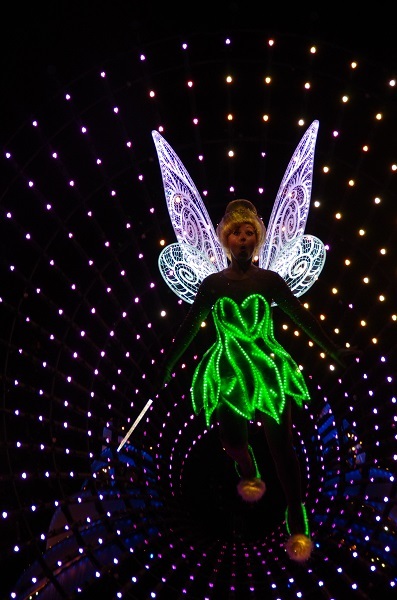 The first float is Tinker Bell, floating in a swirl of pixie dust. 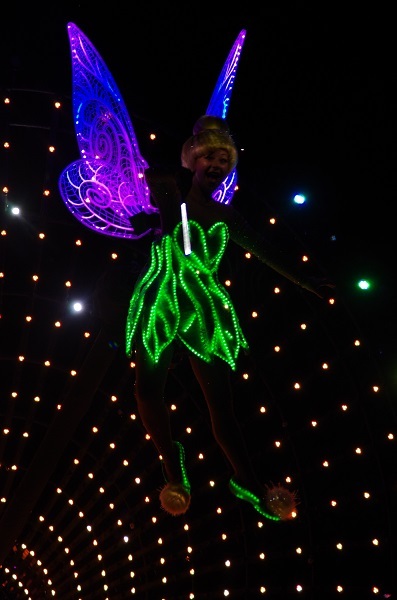 Her Fiber Fairies dance around her and, when the parade stops, the Paint the Night paintbrushes come into play. 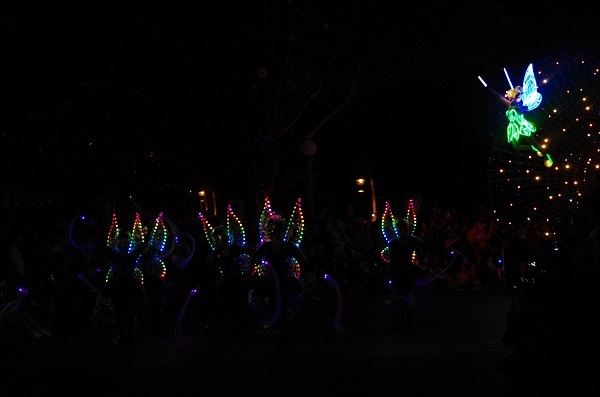 Parade viewers can point their paintbrushes at the Fiber Fairies and change the color of their costumes! 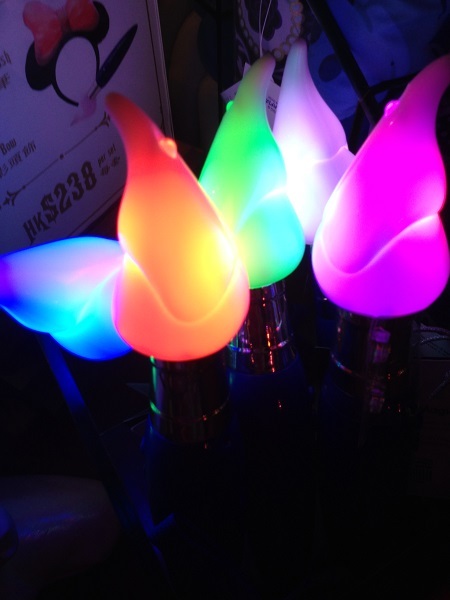 They can also change the color of other paintbrushes, which can make the time waiting for the parade go by a little more quickly. 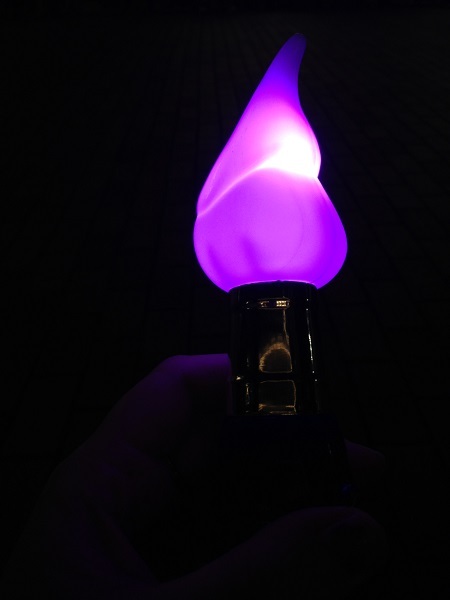 I took great pleasure in changing the paintbrushes of everyone around me to purple, cast members and guests alike. 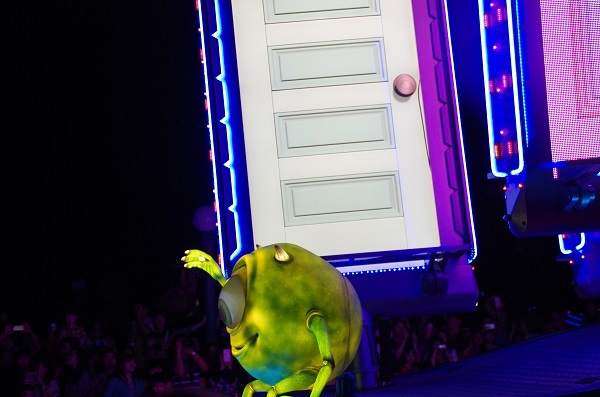 The Monsters, Inc., Scare Floor float follows Tink, with a series of doors that open and close in a light show that contains surprise guests. 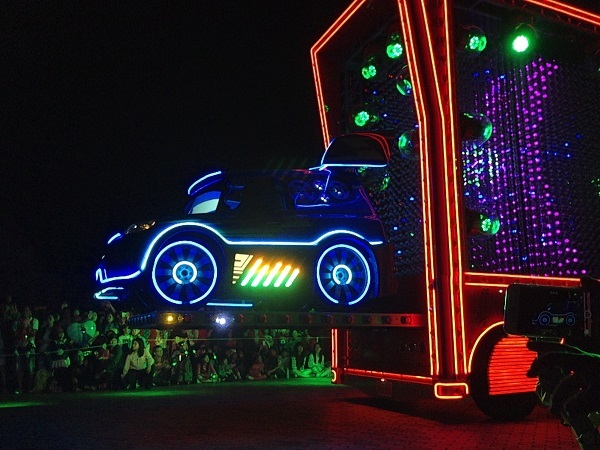 Sulley drives the float and Mike brings up the rear. I didn’t get a picture of her, but I did spy Boo at one point, which made my night. 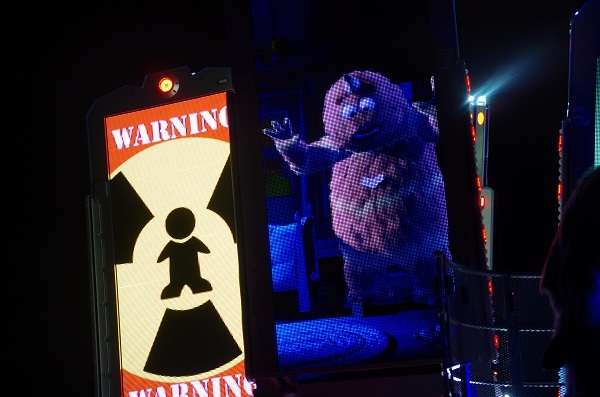 I did catch George, though. 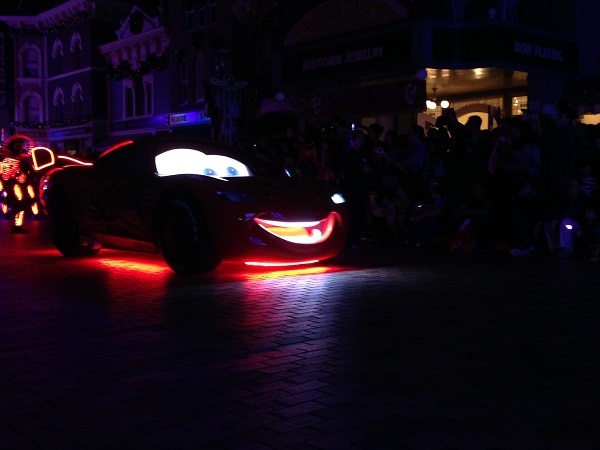 Next up is Lightning McQueen, leading Mack, who carries DJ. 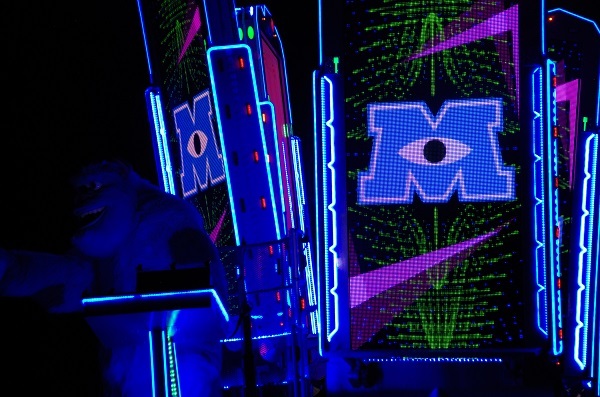 Mack’s sides perform a light show for viewers. 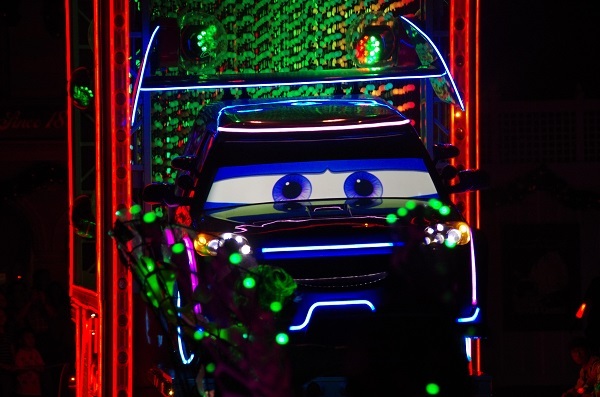 The Cars Crew dance team have programmed costumes and the headlights on their costumes make them look like cars driving at night. 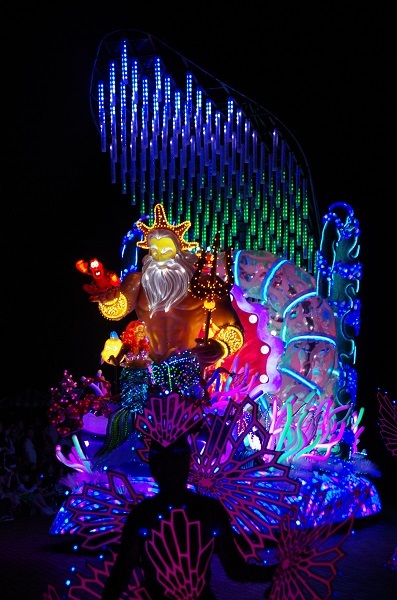 The Little Mermaid float is next and is also interactive. 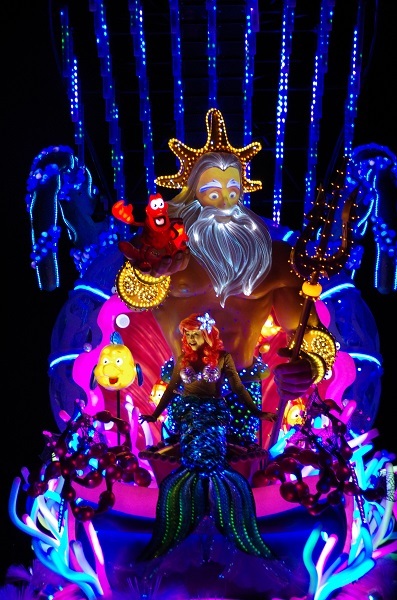 We dive under the sea with King Triton and Ariel, who has a live mic and talks to viewers as she floats by. 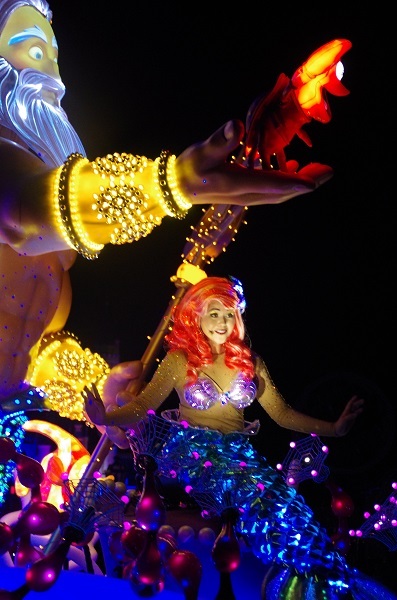 Flounder and Sebastian are floating along with Ariel and King Triton and, as the float passes by, fish swim after it playfully. 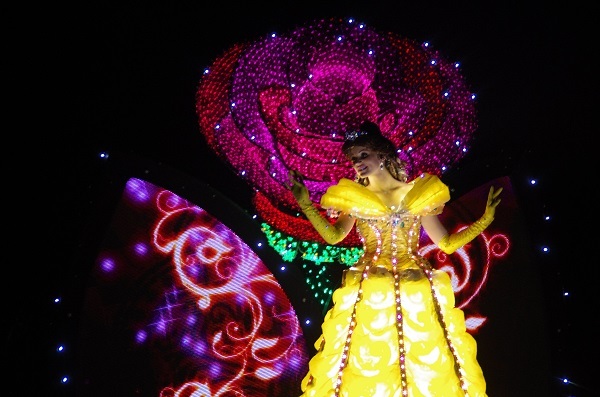 As beautiful as the parade has been so far, nothing compares to what comes next. 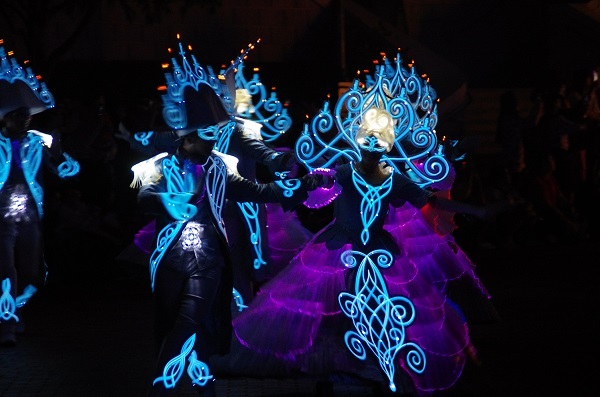 First a series of dancers, dressed in period costumes reminiscent of the Enlightenment with huge bouffant wigs that carry candelabra. 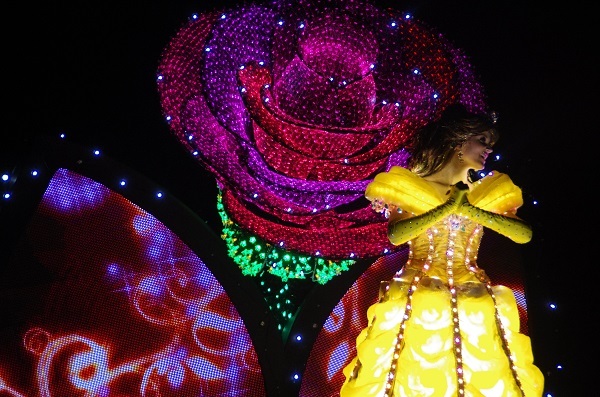 Belle appears, then, standing before a tapestry of light that flickers from image to image, telling her story. 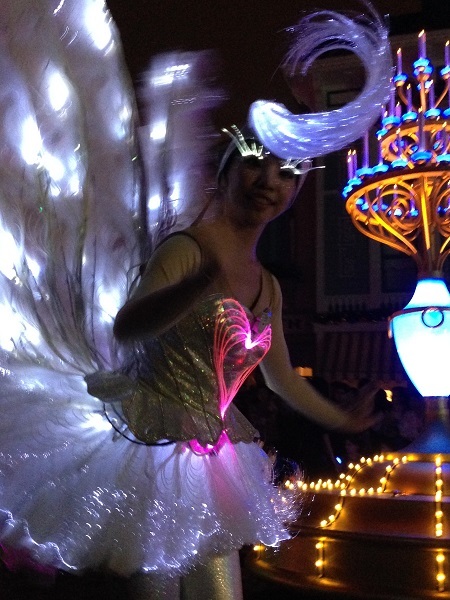 The tail of the float is a series of four candelabra, accompanied by dancing swans with beautiful fiber optic eyelashes, and followed by Rose Goddesses – stilt walkers with rose headpieces over a long green stem. 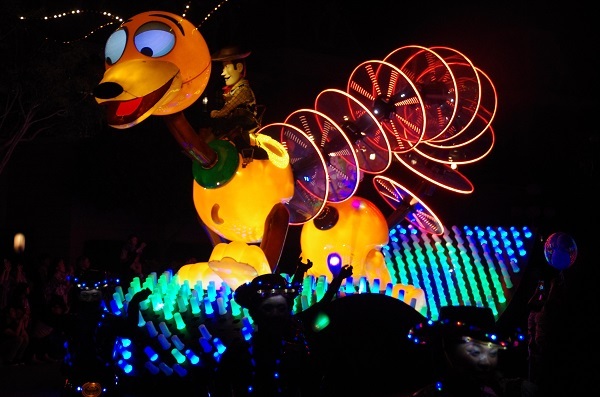 The parade moves from the romantic to the playful with Slinky Dog romping on a Lite Brite, ridden by Woody and Buzz. 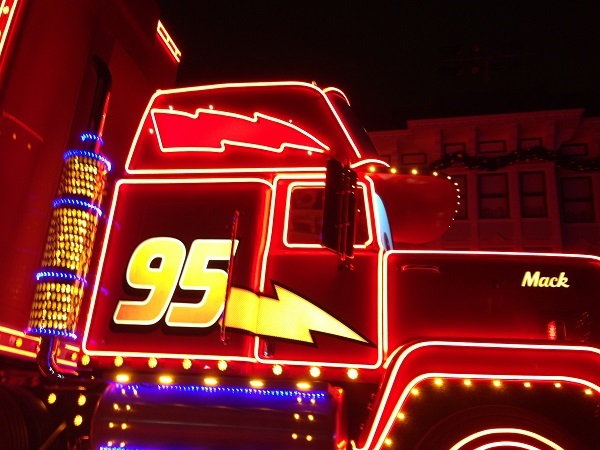 Luxo Balls follow, rolling from side to side of the route. 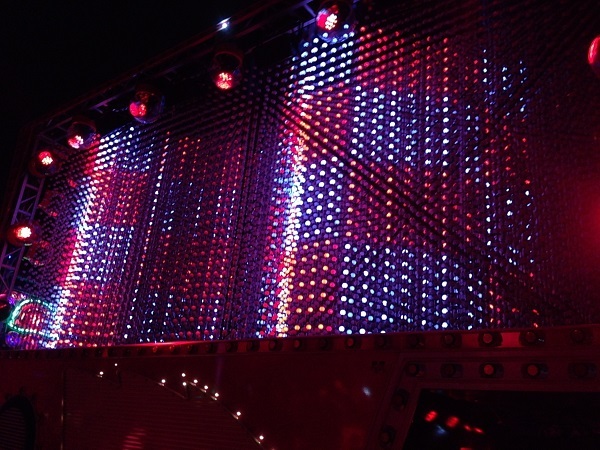 And of course, the grand finale is comprised of classic characters. 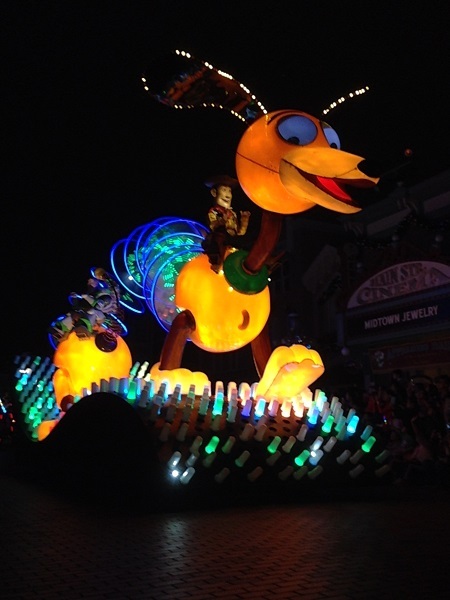 Doodle-bug type mini floats dance past carrying Goofy, Donald and Minnie. 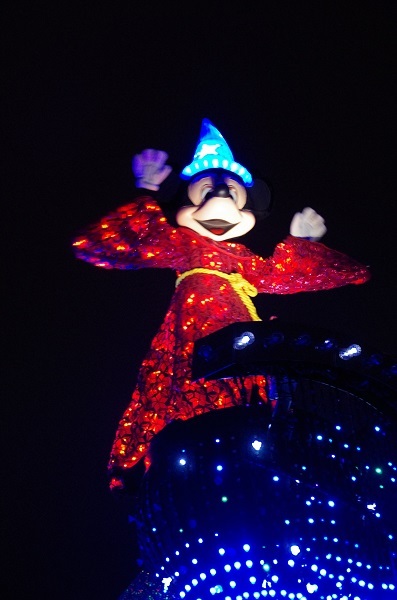 Sorcerer Mickey rides a wave of light high above us, followed by a swirling, twirling, ribbon of light that twists in and around creating a mesmerizing effect – my favorite part of the parade! 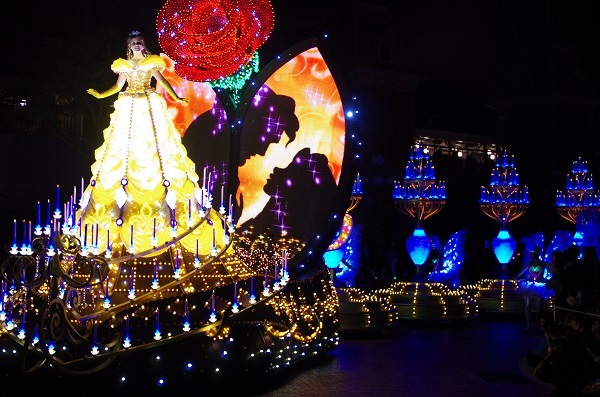 If I could, I would personally thank the 80+ cast members who make this parade such a joy to watch every night. 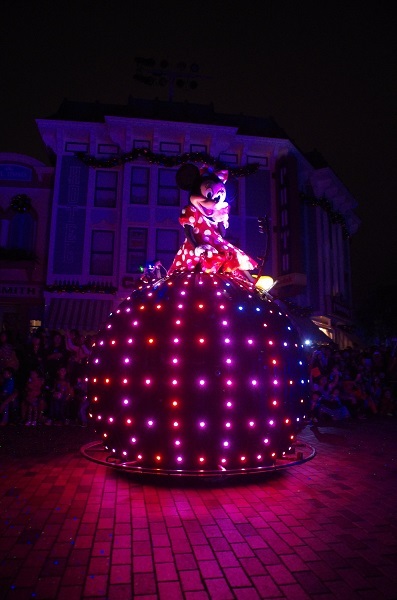 The second night I watched from Main Street, near the Christmas tree, waiting an hour and a half to make sure I had a good spot to watch Ariel interact with the views. 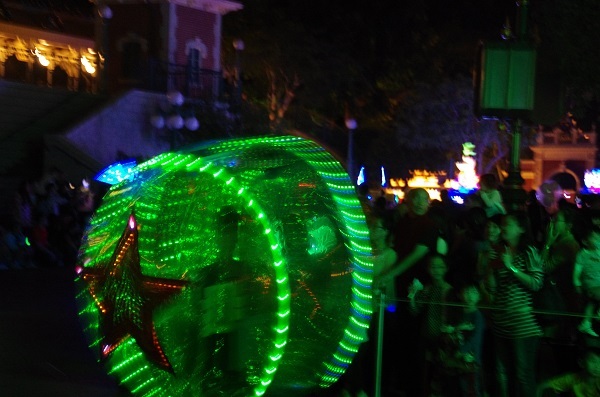 Unfortunately, the park was very crowded and the parade did not make its second stop. 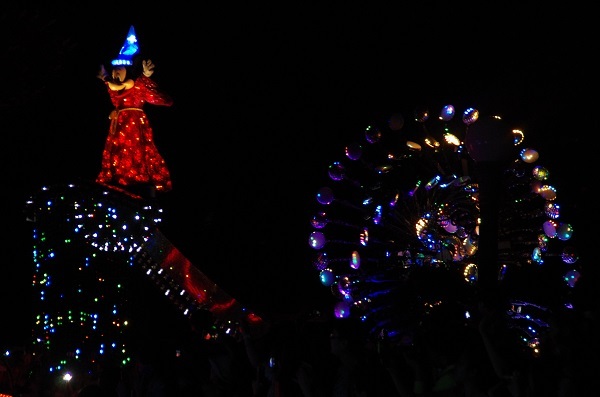 Another parade-watching tip is to cross Main Street as soon as the parade passes the hub and work your way down to Town Square to watch the parade one more time as it goes backstage. 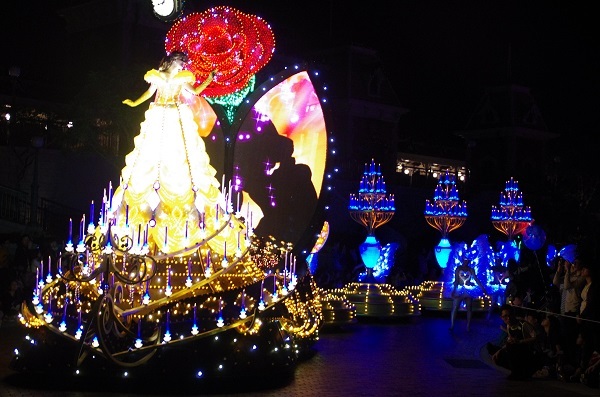 I absolutely love this parade and will do everything I can to get back to Hong Kong to watch it again! 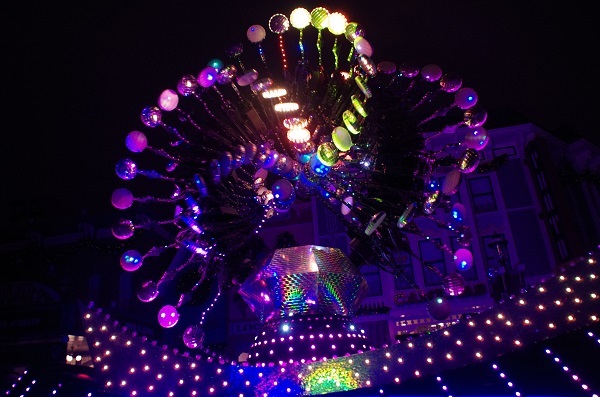 Announcement of Disneyland Diamond Celebration – Twitter Goes Wild #Disneyland60!